Jamie’s Mother’s Day Bouquet, originally uploaded by kristenhenschen. Kevin and Jamie are our wonderful next door neighbors and friends. Since they live so close by (we literally share a wall) and I knew I was doing pink roses for the wedding I am doing this week, I stopped by their house to see if Kevin wanted me to make a custom Mother’s Day arrangement for Jamie. Kevin has told me on multiple occasions that if I am doing a wedding to see if he wants flowers to surprise Jamie with. I have a wedding or 2 virtually every weekend now until December, so I figured now would be a good time to see if he wants any. Since Kevin and Jamie are going on vacation the day after Mother’s Day, he decided that getting the arrangement a week before they left so she can enjoy it would be best. 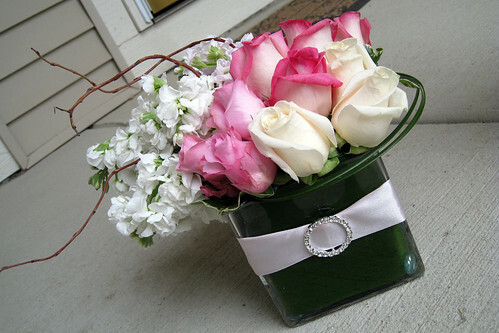 So, I picked up extra roses and stock to make a Mother’s Day arrangement for Jamie from Kevin. I seldom do “personal” orders, but this one required no delivery, and only a little bit to be added onto my order…plus we love them and know this will make Jamie’s day…possibly week! I am on this kick of doing clustered, modern, asymmetrical stuff lately, so I did a dozen rose arrangement in a similar style this time. It has 6 bi-color pink and cream roses, 3 pink roses, 3 cream roses, 4 white stock, 2 light pink stock, and accents of pitt, bear grass, ti leaf and curly willow. I finished it off by adding a light pink ribbon and rhinestone buckle to the front. Those are gorgeous. Good work.